Vertigo is the name given to a feeling of dizziness that can affect balance. Normally vertigo is caused by problems in the inner ear, however, in some cases, it can be a sign of a more serious underlying condition. Vertigo is unique in that it is a symptom rather than a condition. Around 35% of adults suffer from some form of vertigo. Common symptoms include loss of balance and short dizzy spells though in rare cases, these can last for weeks and even months. Magnesium plays a key role in the balance of electrolytes within your body. If you lack an adequate amount of Magnesium, your brain may not send and receive messages from your sensory nerves in a proper manner. Additionally, the brain may interpret messages from the inner ear incorrectly, sensing change even when there is no movement at all. This will cause a sense of dizziness and loss of balance. Simply increasing Magnesium intake has shown to be an effective method in combating dizziness and other symptoms of vertigo. 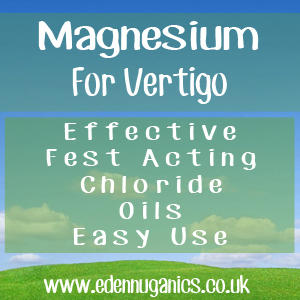 Magnesium chloride is widely regarded as the superior Magnesium compound and for good reason. This extremely pure form of the mineral has avoided all environmental toxins in a similar manner to Himalayan salt. In the late 90's a rare and pristine source of Magnesium chloride was located in an ancient geological formation on the Zechstein Seabed. The Magnesium chloride found here was formed around 250 million years ago, long before the toxins associated with industrialisation could affect this untapped source. For adults, it is very hard to overdose on Magnesium. It has a laxative effect on the body when taken in large quantities, making it hard to reach dangerous levels. When taking Magnesium in supplement form, loosening of the stool can be a sign that you have exceeded optimal dosage and that you should cut down. Coriander seeds - Brimming with essential minerals, the seeds of the coriander plant offer a wide array of benefits for the body. For best results, soak a tablespoon of coriander seeds in a glass of water overnight. In the morning filter out the seeds and drink the water for instant relief. Gooseberry - Gooseberry tea is another great natural treatment for vertigo. It is packed full of vitamins and nutrients and is known to help with dizziness due to its powerful antioxidant action. Gooseberries are also known to help regulate blood pressure and aid in efficient circulation of blood to the brain, which again can help to reduce the symptoms of vertigo. Lemon Juice - Lemon juice is full of vitamins as well as potent antibacterial and antiviral properties that can help to protect and heal. The antioxidant properties of lemon juice also make it a great at reducing the number of free radicals in the system, something known to have a direct impact on levels of dizziness and vertigo.